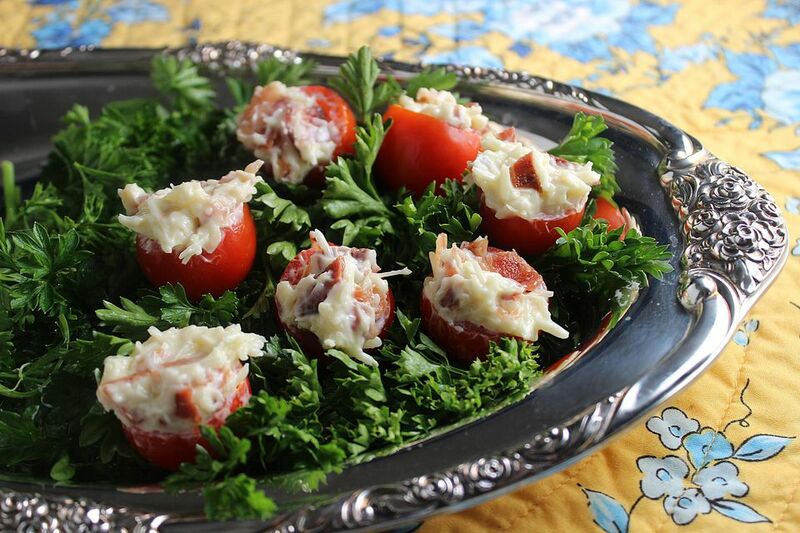 Bacon Stuffed Cherry Tomatoes are the most popular appetizers I have ever made. In fact, double the recipe and you still won't have any left over. This recipe is fussy to make, but it's easy. Just settle in and resign yourself to stuffing tiny tomatoes with a wonderfully flavorful creamy mixture. As a bonus, eat a spoonful or two of the filing as you work! I just love the new pre-cooked bacon on the market. Just warm it in your microwave to crisp and it's ready to use! No mess, no fuss and no clean-up. Just make sure that you use real Parmesan cheese, real mayonnaise, and real bacon. I once had someone tell me they made this recipe with nonfat mayo, Parmesan from that green box, and bacon bits. And then they couldn't understand why it didn't taste good! You can cut a very thin slice off the bottom of each little tomato so they will stand upright, but I think that is unnecessary and just adds work. Use my tip below for lining the serving tray with parsley to keep the little tomatoes upright and looking pretty. For a vegetarian version of this recipe, try substituting cashews or diced avocado for the bacon. These appetizers are perfect at the start of a summer meal when you're grilling outside. Because you have to make them ahead of time, they are perfect for entertaining. They are also great as part of a buffet if you want to throw an appetizer party. Cut the top off each cherry tomato, and using a melon baller or a sharp knife, carefully scoop out the seeds and pulp. Place each little tomato upside down on paper towel to drain. Combine the the mayonnaise, Parmesan cheese, garlic powder, basil leaves, and bacon in a small bow and mix well. Stuff each cherry tomato with the bacon mixture using a very small spoon. Cover all of the stuffed tomatoes and chill in the fridge for at least 2 hours to blend flavors before serving. To serve, I like to line the serving tray with parsley to keep the little tomatoes from rolling around. It's very pretty too. You need to use curly parsley to keep them upright - lettuce won't do the trick.